Remarketing ads are a way of getting back in touch with previous visitors to your website. This is done by placing a cookie on your site, which then allows us to identify this user as someone who has already been on your website. Remarketing ads can also be a form of PPC (pay per click) advertising, which means that you will also only be charged if this visitor returns to your website again. Your previous website visitor audiences can be targeted when they are conducting searches again or on the Display network, allowing you to remind them of your offers or to promote something new to them. Remarketing ads can enhance brand recall by appearing in front of people to remind them of a product or service they had initially viewed on your website and prompting them to visit again – thereby giving you the opportunity to make a second impression. You can also target your remarketing audiences when they are conducting searches, allowing you to bid effectively for customers who are already aware of your services. Effective use of remarketing can help you to ensure you are visible when users are moving down the conversion path and especially at that part of the purchase cycle where they are consciously seeking further information – or at the point where they are ready to buy – so remarketing ads also have a tendency to see higher conversation rates and stronger ROI (return on investment). 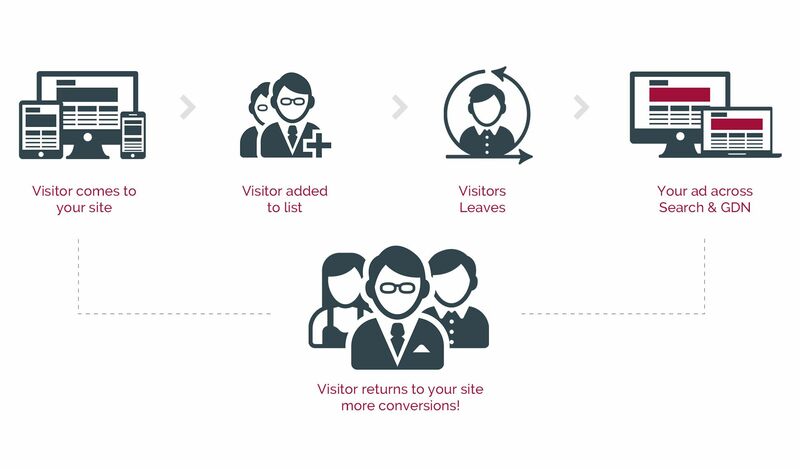 Re-engage users who previously visited your site and show them relevant ads across the web.